For any of you that just bought your favorite tree at the nursery, are you ready to plant, no instructions included? One of the things you might need to consider is guying your newly planted tree. Here are the top guying tips for those newbie trees in your landscape. Let’s just brush up on why one guys a tree. One point of clarification - guying is not meant to straighten a tree. Check out those past posts about purchasing plant material with proper structure, which truly is an art and one that you must be good at because you can find these misfit trees in almost any nursery. If you start with a structurally sound tree, plant it correctly so it stays straight on its own. This common mistake of a tree planted crooked is done more often than you think. Just do some drive-bys on some newly planted or not so newly planted properties and you’ll get my drift. Mother Nature doesn’t do all those twisted contortions; bad planting accounts for at least half of it. Now back to the basics of ‘Guying 101’. Guying stabilizes a tree during its first year to year ½ while its roots are getting established. Words of caution: this is not a ‘set and forget it’ procedure. Guying systems need periodic inspection and adjustments to be effective; in other words, never too tight or too loose. The guying cables or wires may need repositioning during the establishment period to ensure there is no girdling to the tree’s trunk. 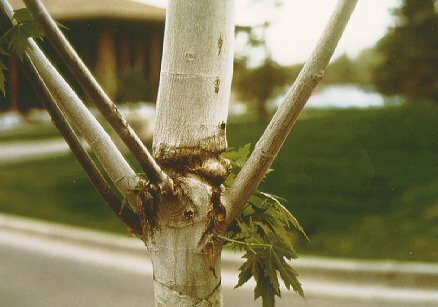 Girdling can cause structural weakness to the trunk and can be extremely problematic down the road as the tree matures. Translation – improper guying can leave more than just a mark! So when is guying necessary on newly planted trees? First and foremost, you guy to ensure that the tree stays straight as the soil settles around the newly planted ball. Trees with very heavy canopies like evergreens or large shade trees also require a guying system. These trees are particularly vulnerable during the winter months when heavy snow and ice are prevalent and especially when the ground is not totally frozen. The mud season is also another time when guying newly planted trees is crucial as the ground is extremely soft. In areas of high wind exposure, guying is a must. What to use in the guying process? There are a number of systems from the simple to the complicated. Let’s start with the traditional. Wooden stakes triangulated around the root ball with wire and hose is the old-fashion way of guying a tree. If you want to make this system adjustable, you have to add a turnbuckle into the mix. The hose protects the tree’s trunk from the wire. Another option is cable and earth anchor/duck bill guying kits. These kits offer easy installation and all the gadgets necessary for adjustment but can be fairly pricey; however, not nearly as expensive as an uprooted tree. Remember - one size does not fit all. All guying kits must be sized appropriately to the height and/or caliper of the tree. For instance, if you are planting a 4” caliper (diameter of the trunk) shade tree, it requires a 4-stake guying system or a guying kit appropriate to that size tree. These kits are clearly labeled and marked according to size.